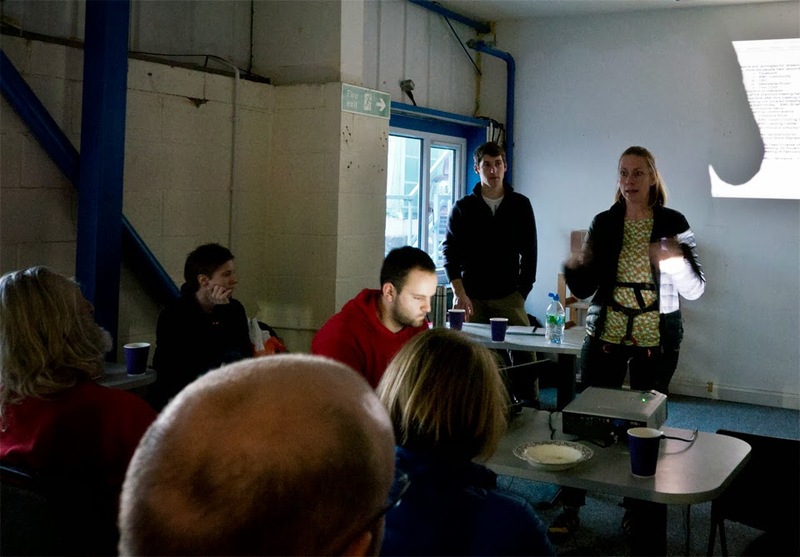 The BMC's South East meeting took place at the Reach Climbing wall today at 16:00 as planned. The BMC kindly supplied food and drinks and the Reach Climbing Wall kindly supplied the facility of which the meeting took place. Although there were many people at the wall, the turn out was unfortunately relatively low. Introductions and updates were presented from members of the BMC including Elizabeth Holley who is currently the regional development officer for London and South East. Amongst other items, news of a price increase of BMC membership was disclosed. The more pressing matter concerning the Harrison's toilet facility was discussed and although the BMC own Harrison's rocks, there seemed to be a desire from the BMC to distance themselves from the subject as currently the BMC are unwilling to offer any financial backing to continue the facililty. Without financial support or a means of generating an income to support the facility, the outlook does not look too good. 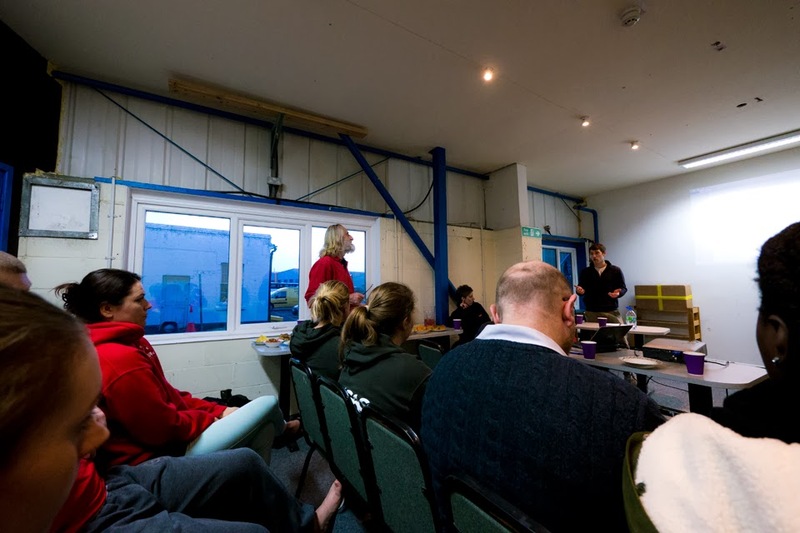 Members of the sandstone local climbing community were present, specificaly Sarah Cullen and Malcolm McPherson, to supply information regarding the proposed creation of the Birchden Wood Facilities CIC. The main belief is that many people travel from London to visit the rocks and upon arrival need toilet facilities for the obvious reasons. Without these facilities Birchden Wood will become a dumping ground of human waste making for and unsightly and unhealthy environment. See Below for more information regarding the Birchden Wood Facilities CIC which was proposed on December 12, 2013 at 08:48AM for public vote on the Forestry Commission Website. Birchden Wood envelopes Harrison's Rocks, one of the longest and nationally important sandstone rock outcrops in the UK. This, with the other natural aspects of the wood makes it an area of Outstanding Natural Beauty and a valuable asset to the local communities and the nation. A group of like-minded and motivated local individuals that are part of a far larger group of interested parties and volunteers from across the country, are determined that the sensitivity, peace and tranquillity of the site is maintained whilst the current public facilities including the car park, toilet block and camp site, are secured and sustained for the long term. Part of this aim has already been successful in persuading the main stakeholders to act to restore the facilities to a good and proper order and for them to be re-opened in January 2014, as agreed with the Parish Council. ... The facilities were put in place several decades ago to protect Birchden and Groombridge and they carry capital and operating costs that are currently met from a management fee paid by Sport England to the British Mountaineering Council who now own the rocks. This financial support will cease during 2014. Work with the key stakeholders and the Parish Council to re-instate the refurbished facilities incorporating an effective system to capture camp site and parking fees to cover the operating costs (work-in-progress). At the start of 2014, visitors’ data will be recorded and profiled along with other considerations needed for effective cash flow, general management and for stage 3. Implement a communication campaign to inform the public that all revenue collected will be for the running and maintenance of the facilities and that Birchden remains a community asset. Once the facilities are reopened, negotiate with the current stakeholders’ with a view to releasing them from the current lease, at some stage during early 2014, and for the BWF-CIC to take a new independent lease directly with the Forestry Commission. Consider with the available funding sources, the need and viability of a redesign/low key redevelopment that may incorporate a new build with refreshed camping and related facilities, with a small educational covered area that explains the site’s geological importance, environmental and ecological sensitivity and so on. This more or less maintains the status quo in respect of Birchden but provides an option to improve or sensitively enhance its use for the variety of visitors currently enjoying access through the improvement of its facilities and thus continue to protect the wood and Groombridge. The key issue is to ensure any scheme has the management capability and income that will sustain this well into the future and we are confident in this respect.